The plot involves an "intrinsically masculine" heroine who supplements her small inherited in-come with her contributions to womens journals. Rejected by her attractive male colleague in favor of a pretty but frivolous art student, Anna Marsden assumes the persona and clothes of a man, whereby she gains the friendship of the male colleague and the love of the art student. A copy of the authors only book. Ellen Williams. 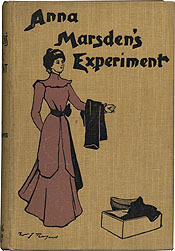 Anna Marsdens Experiment. London: Greening & Co., 1899.